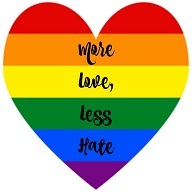 The Second Pride Festival is well under way, and as well as all the parties and performances going on, there is a lot of other stuff to see over on the three Pride sims. When you teleport over to Pride, you will land at one of the fixed landing points, but I found that once you have landed you can TP freely to the LM you want to visit by hitting the same LM again, and it was easy to move around between all these places of interest, which I received in a handy group notice today. Here is everywhere I visited today, with some pictures I took on my travels. *Edit: I have added the LM and some pictures from Parade Street. Have some fun there riding the floats! You can spend some quiet time here, and if you wish light a remembrance candle for a loved one. A history in photographs, text and video clips of civil and human rights leader Harvey Milk, a champion for LGBT people. A peaceful place to wander and see work from a variety of artists in SL. More LGBT history, including the history of the Stonewall Riots that lead the way to the fight for LGBT equality. See all the parade floats from the weekend’s parade. Tags: art, Gallery, garden, Harvey Milk, LGBT, Memorial, Pride, Second Life, SL, The Second Pride Festival. Bookmark the permalink.